bradgalbraith had the most liked content! 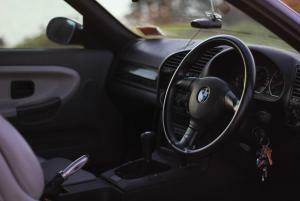 Another mini update- recently bought a ZHP gearknob to replace the rubbish old one. Also bought and installed a set of Powerflex rear camber arms. Hopefully I'll get a spare minute in the next week to install the Powerflex rear trailing arm bushes. The plan is to then get tyres and an alignment afterwards in preparation for cert. Also a nice little photo in there of the new daily driver.. I thought that the 316,318,320,325 all came with the G220 and the 328i and 3.0 M3 came with the ZF? Keep it how it is. I have done a very similar kind of thing with my E36 and I think it offers a really good middle ground between a racecar and a street car. I wish 🤣 you must have the wrong Brad. Side note- there's a fully rebuilt S50B30 vanos on trademe that someone has desperately been trying to sell for a fair bit of time. You might be better off buying it and putting your one on the shelf and rebuild it one day. I really like them for a number of reasons- Cost is decent, they feel nice and firm and they were easy to install -overall, a quality product. I guess it's hard to say too much more than that as there are many factors that make up how the car feels and handles. They are undoubtedly a vast improvement on the floppy factory ones that were in there before. After putting the new control arms in too, the front end has really tightened up. You can drive much harder through the corners and the car doesn't squirm and dart around like it did before. Just need to get an alignment done to get both wheels to have more toe in. Looking at getting the Powerflex rear camber arms and rear trailing arm bushings before I do my alignment. Has anyone had experience with Powerflex camber arms? A friend of mine has Hardrace camber arms and doesn't rate the quality of them too highly.. Slight update- Style 24s have since been sold and replaced with BBS RK 17x8s. I've also replaced the front control arms as the old ones were knackered. Pro tip- if doing this job, it is made 10x easier if you spray some CRC/WD40 on the thread before you try and remove the outer balljoint that connects onto the hub.. the first one took me a while. I also had a good friend of mine polish the car to bring up the Cosmo Schwartz shine. It's coming along slowly but surely. I've recently gone through the MVDT because of a dodgy car from a dealer and I can assure you, you can't hide behind 'as is where is'. We won the case convincingly. Have you still got this mate? Keen to come round and take a look. I'll PM you.